Last week, a leak in a storage tank at the country’s largest radioactive dumpsite expanded substantially, sparking concerns that other tanks are on the verge of failing, too. This fear may have already been realized. Rumors are flying that a second of Hanford’s 28 double-shelled radioactive waste tanks is exhibiting early signs of failure. King-5 News, which broke the story of the expanded waste leak at Hanford site’s AY-102 storage tank, is now reporting evidence of a second tank breach, citing anonymous sources familiar with the situation. The tank in question, AY-101, is the same age and has the same design as AY-102, which began leaking in 2011. 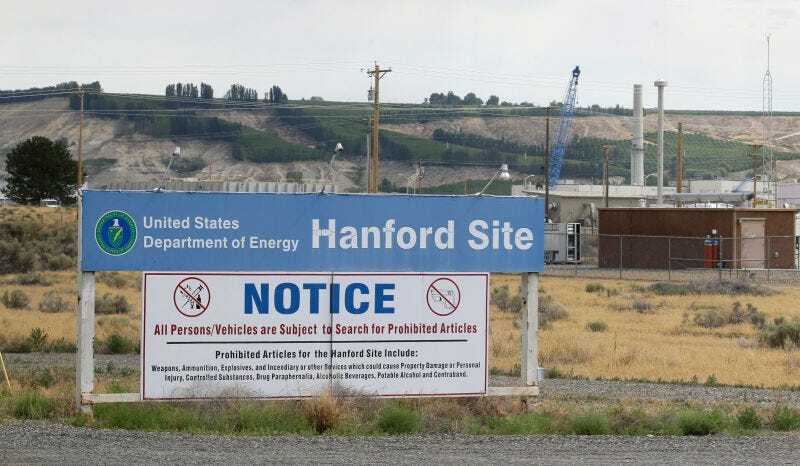 Both tanks, along with ten others at the Hanford facility, share a construction flaw identified by the Department of Energy several years back as a potential risk factor for failure. Hanford is a legacy site that produced plutonium for the world’s first nuclear bomb, and for almost 60,000 more nukes during the Cold War. Its last nuclear reactor was switched off in 1987, and a year later, it was taken over by the DOE, the Washington State Department of Ecology, and the EPA for long-term environmental remediation. Due to the site’s aging infrastructure, that remediation process has been slow and dangerous. Today, 53 million gallons of toxic sludge from the dawn of the nuclear age still sit in decrepit tanks at Hanford, waiting for the government to build a remediation plant. In the early 2000s, evidence of widespread leaking prompted the DOE to transfer the bulk of the waste from 148 single shell tanks built in the ‘40s and ‘50s to 28 larger, double-shelled tanks built in the 1970s. The hope was that the double-shelled tanks would prove more robust, but in 2011, tank AY-102 sprung a leak. Last week, as the final drops of radioactive waste were being transferred from the busted tank into others, facility workers noticed that the leak had expanded substantially. The result: an accumulation of eight inches of radioactive waste between the inner and outer hull. Both the state’s Department of Ecology and the DOE told Gizmodo that this was an anticipated result of draining the tank. Sources tell KING 5 that alarms went off last week to alert staff of the presence of “hot” (radioactive) particles trapped in filters of the tank’s continuous air monitor (CAM). The sources say this is the first time readings of this sort have been detected in AY-101, leading people very familiar with the tank to believe the tank is beginning to fail. The environmental watchdog group Hanford Challenge issued a press release today claiming that is own sources within the facility have confirmed elevated radiation levels outside of AY-101's inner shell; something that shouldn’t occur if the tank is airtight. And that would be a big problem for Hanford, which doesn’t have enough room in its 26 remaining tanks to accommodate the extra waste. The facility would need to install new tanks, a process that could take several years. Alternatively, it would need to vastly accelerate plans for a long-term remediation facility, currently scheduled to come online in 2036. Gizmodo has reached out to the DOE and the state’s Department of Ecology for comment and will update if we hear back. Update 4:30 pm: DOE tank manager Tom Fletcher told the AP that visual inspections of the tank have found no evidence of a leak, but that air samples showed elevated levels of radioactivity between the tank’s inner and outer hull. DOE officials are currently looking into the matter. During routine filter inspections, higher than normal readings for contamination were found on filter paper installed on a continuous air monitor for Hanford’s double-shell tank AY-101 annulus. While these readings were higher than normal, they were well below the alarm level. Leak-detection instruments, located throughout the annulus, are monitored to detect any liquid on the floor of the annulus space. No liquid has been detected in the AY-101 annulus. Following confirmation of the filter sample readings, workers completed a video inspection of the AY-101 annulus and the results showed no visual change from previously conducted inspections and no indication of a leak. DOE is conducting engineering analysis and assessments to determine potential causes of the readings.